Caution I am not a mechanic or engineer, simply a backyarder. I am simply relating to you how I personally performed this task; I accept no responsibility for accidents or errors which occur during or after following my personal experience. I could have re-used the front and rear swing arms but I would have to modify them. Using wet arms with rubber cones gives a much firmer ride which is why racers do this. I chose to replace the wet arms with the dry ones, as this is the preferred option. 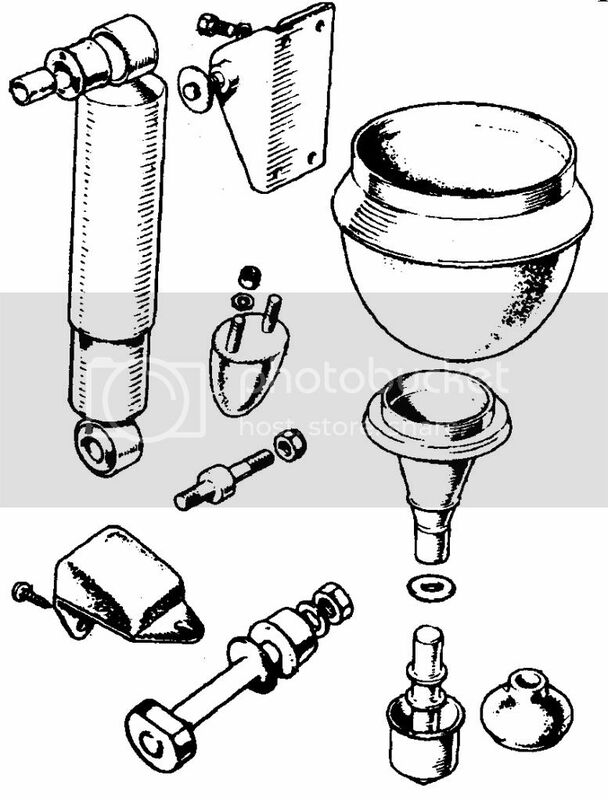 Modification of the front arm involves unbolting the bump stop from the arm removing the 7/16 bolt and enlarging the holes in the arm and bump stop bracket to take a ½ inch bolt. The rear radius arms can only be used by fitting longer (moke) trumpets or Hi-Lo adjustable suspension. I would have also needed to press out the wet radius arm stub axel and replace them with the dry type which has the bolt for the bottom shocky mount. When using the dry swing arms I had to relocate the brake lines flexible hose mounting point to the bracket at the top of the swing arm and to the hole at the top of the sub-frame by carefully bending the brake line to suit. Firstly I depressurised the Hydolastic system then jacked up the car until the suspension was loose. I supported the car with chassis stands and removed all the wheels. At the front on each side I undid the top ball joint and supported the hub and brake assembly. I removed the nut and washer from each end of the top arm pivot pin shaft. I bent up the front inner guard for better access. I removed the front thrust collar retaining plate, the collar and seal and pushed the shaft forward out of the arm and sub-frame tower. I removed the rear thrust washer and seal and manoeuvred the arm from the sub-frame. 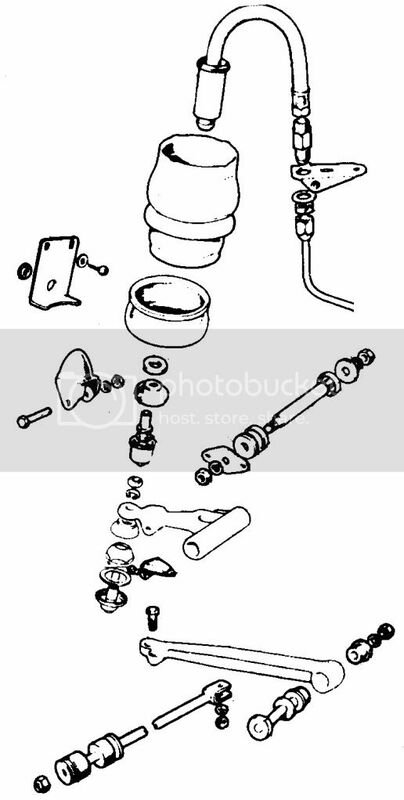 This operation is made more complicated on the driver’s side due to the location of the brake light pressure switch. Be patient and careful. I disconnected the displacer hose, and then pushed the displacer upwards to allow access to the two displacer bracket screws. With the brackets taken out I turned the displacer anticlockwise to disengage it from the locating tabs in the top of the sub-frame tower and removed the unit. With a suitable tool I bent the displacer unit location tabs clear of the locating ring. I assembled the dust cover knuckle ball and new nylon cup using plenty of grease. I installed the front trumpet and knuckle assembly into the rubber cone. I pressed the knuckle assembly into the top swing arm and manoeuvred the arm, rear thrust washers and seal into the sub-frame. I inserted the pivot pin, front seal and thrust washer and retaining bracket. I installed the front and rear washer and nut. I cleaned the top shocky mount bolt threads and installed the mount. I re-fit the top ball joint, inserted the bottom shocky mount bolt through the swing arm and re-bound rubber mounting bracket. With the spacer in place then I installed the shocky. Well that’s the front done! Start with the hydolastic system depressurised, the car jacked up and supported the car with chassis stands and the wheels removed. On each side I removed the brake drum and hub and then the hand brake cable and the brake backing plate assembly. I removed the flexible brake hose from the radius arm and sub-frame mounting points. I spread the handbrake quadrant and released the cable from the arm. I removed end finisher from the sill panel and removed the inner and outer nut and washers from arm pivot shaft. I loosened the helper spring lower retaining nut and removed the nut. I undid the four bolts from the swing arm mounting bracket and removed the bracket. I withdrew the pivot pin from the arm and released the helper spring and removed the swing-arm. In a similar fashion to the front I turned the hydrolastic displacer anti-clockwise to disengage it from the locating tabs and removed the displacer unit, extension shaft and ball from the sub-frame. 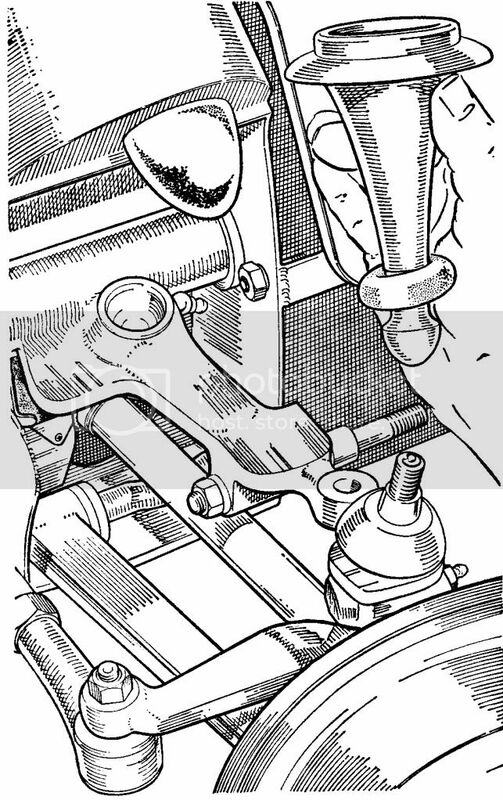 Access to the left hand rear helper spring upper nut can only be done after moving the fuel tank. 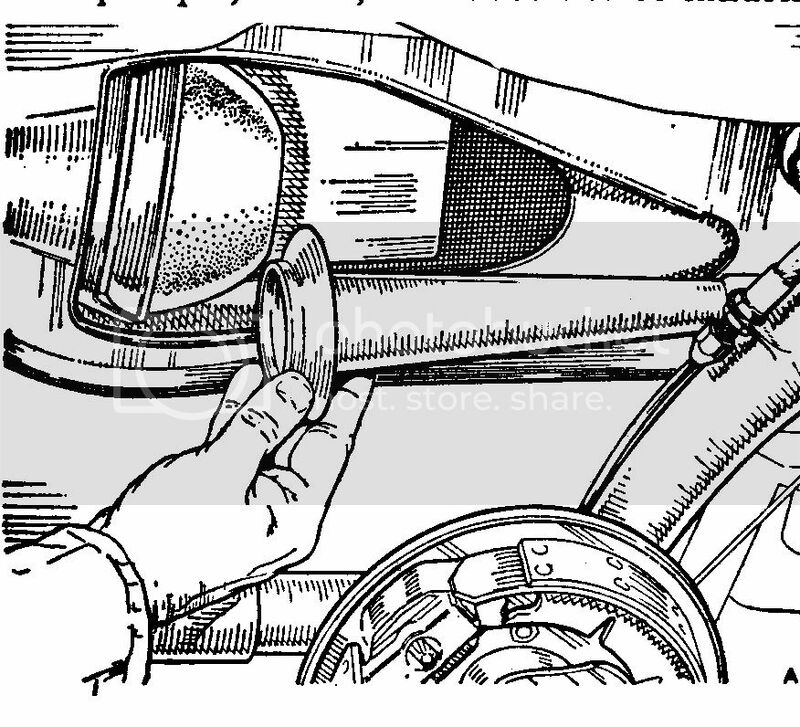 Depending on the car it’s possible to gain access by lifting and pivoting the tank from its mounting position or completely removing the fuel tank. I had to remove the tank by firstly draining it by loosening the drain plug or disconnecting the flexible hose, I then removed the filler cap, disconnected the electrical leads from the gauge unit and unscrewed the bolt from the securing strap. I was then able to withdraw the tank from the boot. I assembled the dust cover knuckle ball and new nylon cup using plenty of grease. I pressed the knuckle assembly into the trumpet and rubber cone assembly. I put the pivot shaft into the swing arm and installed the swing arm into the sub-frame I tightened the inner washer and nut. 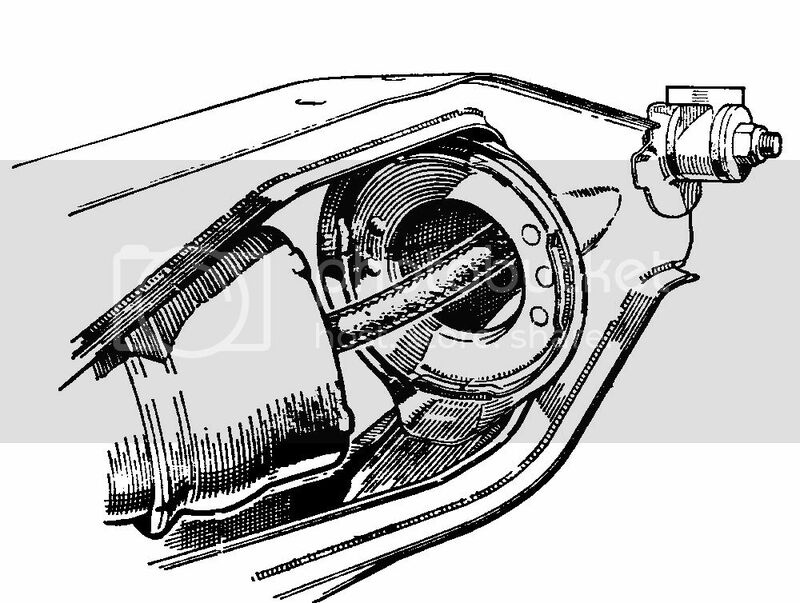 I pressed the knuckle, trumpet and rubber cone assembly into the swing arm and manoeuvred it into the sub-frame locating ring. I inserted the four bolts from the swing arm mounting bracket and installed the bracket. I installed the outer swing arm pivot shaft washers and nut and fitted the sill panel end finisher. I installed the rear shocky onto the arm and extended it into the boot. I fitted the top shocky mount bushes and tightened the retaining nut. I installed the fuel tank. I installed the handbrake cable into the quadrant and brake line flexible hose on to the swing arm. I installed the brake backing plate and fitted the hand brake to the arm. I installed the hub, brake drum and wheel. I adjusted and bled the brakes then lowered the car.